Modified 80 series Landcruiser, Episode #5. We first meet Deb on one of our Video trips and from the get go we knew her 80 would be walking up everything. 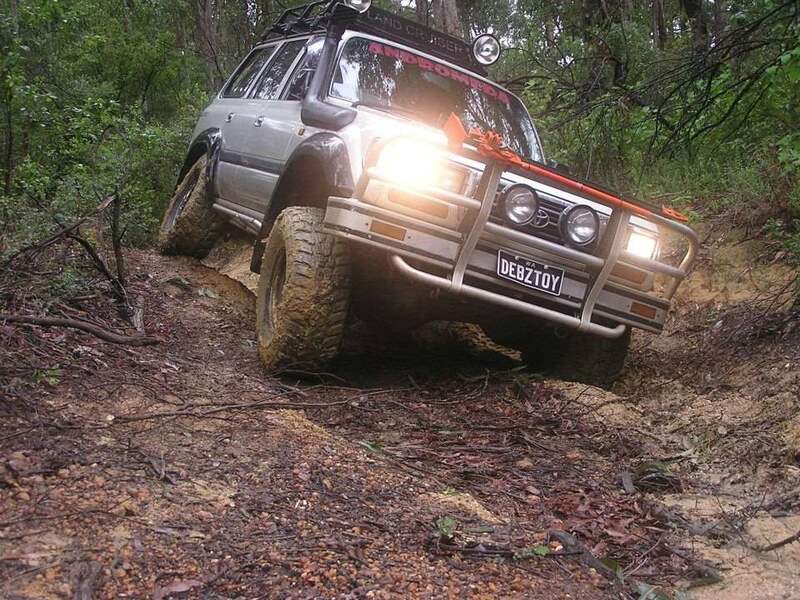 The 80 series Landcruiser is considered one of the best 4WD’s ever made when it comes to tough tracks, thanks to the all-round coil suspension they just seem to handle everything with a lot more ease than other vehicles keeping the wheel in contact with the ground longer than expected. Along the trip on some tough tracks Deb’s 80 was one of the only vehicles that didn’t get stuck and she knows her stuff when it comes to picking lines and pushing the pedal at the right time. The 80 series Landcruiser's are getting on and it’s hard to find one without low km/mileage but they are a good bit of quality vehicle. For some ideas when it comes to modifying check out what Deb has done to her beast aka ALF! Engine: Safari turbo and dual battery system. I have an ARK pack which I will be getting a third battery for and will be utilising that a lot more. K&N air filter and 3”straight through exhaust. Electric upgrades: Electric brake gadget for towing trailers etc. Comms & GPS: GME 80 channel uhf, and an unknown HF needing a new antenna, and a Barrett 250 and Antenna is on its way. Plus I have a VMS which I am still learning how to use. 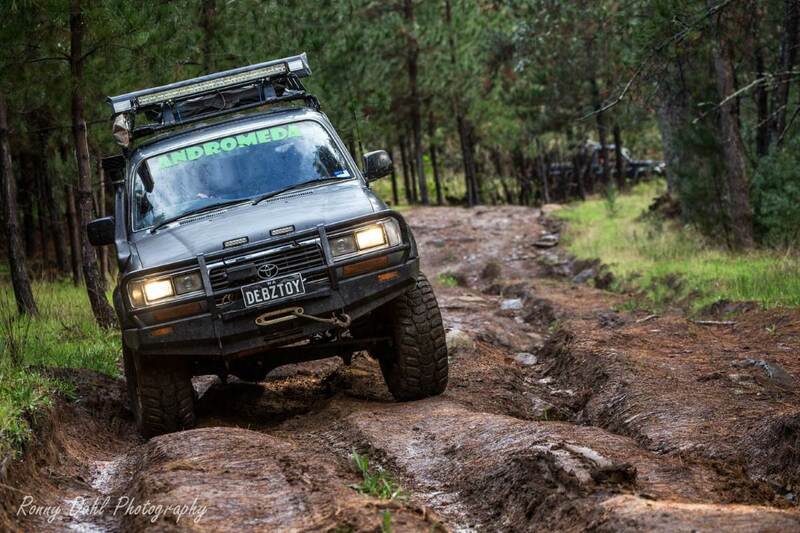 Suspension and tyres: 3”flexi coils and 35”KUMHO KL71s Mud tyres. Overhead roof console with the CBs in them as well as a reading light. Front old sheepskin covers that work great not to get the seats dirty. ARB front steel winch bar with 12,000LB IMAX winch from EBay. FULLY recommend them. Rear ARB steel bar that had a spare wheel carrier and a jerry can holder, so Dad and I took the jerry can holder off and made another spare wheel carrier, we also had to cut off the original one and move it over to make them both fit evenly on the rear. Side steps are rock sliders with the chequer plate pop riveted on, but I plan on taking the chequer plate off as the pop rivets keep coming loose and the plate rattles. VERY annoying: /. ARB front and rear air lockers with the on board compressor under the bonnet. Roof rack bought from EBay with free delivery. He also has the part time kit installed. Side awning and a rear awning, and another side awning is currently on its way. 160L long-range tank that fits in where the current sub tank sits. 120W Solar panels but they do not stay on the car. Side awning tent for camping. Webber BBQ for longer camping trips, and to come is a water storage system, either the bladder or the steel tank….am still undecided which way to go yet; and under bonnet shower is yet to be installed, but is ready to go. HID reverse lights, 3500kg rated rear bar, tow hitch, and soon to be gull wing windows replacing the very rear windows in the wagon. Also has rear drawers and a fridge slide, with a wired in cigarette lighter for the ARB WAECO 60litre fridge/freezer. 1 x Bog out in case you cannot use your winch with anything. 1 x winch dampner. 1 x 160litre per minute air compressor. 3 x spare belts and hoses. 1 x Puncture repair kit. 2 x first aid kits. 1 x kangaroo jack stand. 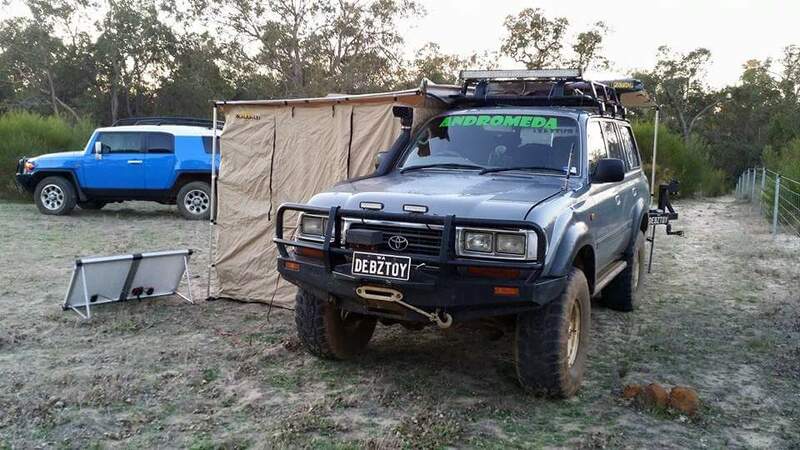 Modified Video Of Deb's 80 series Landcruiser. Kirup was another great trip. Harvey is my favourite playground. Every time I take Alf out, he never lets me down. Every time I am out in the bush is an unstoppable moment, he does what I tell him to do, and how I tell him to do it, and he has not let me down yet. Even with broken and shattered CVs, he still keeps going without any struggles, even thou I know I shouldn’t be; he still amazes me and makes me proud every single time. In my last 80, I was teaching my daughter how to drive (She is on her “L”s); she had done approx. 22 hours already by that stage. She does not like 4WDriving, so she used to drive there and back and I used to do all the 4WDriving. Mother’s Day morning 2014, we were on our way to do Logue Rd. I told her to turn up ahead and noticed he changing from 5th down to 4th and I knew we were gone. Next thing I remember is watching my coffee dribble onto her hair and wondering why the hell my dog was on the road outside. Front windscreen gone, Teesh looked like she had her legs stuck under the dash. My friend Martin came straight through the car window and asked if we were ok, he unbuckled me so I could lower myself down to Teesh without falling on top of her, unbuckled her and pulled her out of the car. 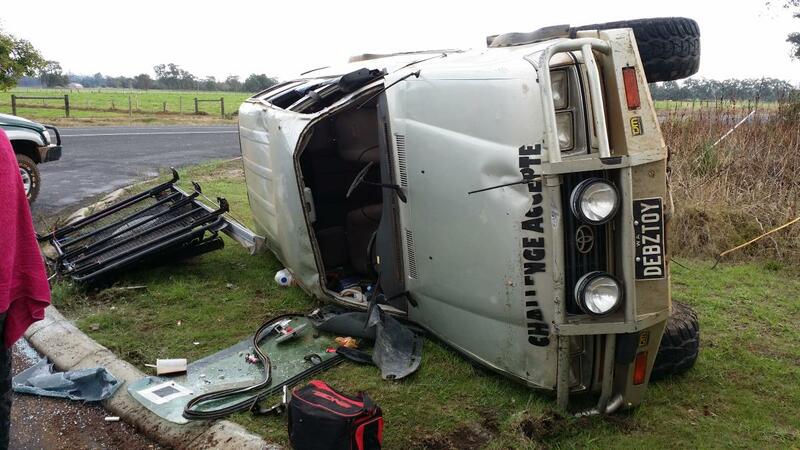 We’d rolled over. She mistook the brake for the accelerator and she floored it around the right hand corner in 4th gear flooring it at 70km/h+. Martin had his in car camera going and caught the whole thing on video. 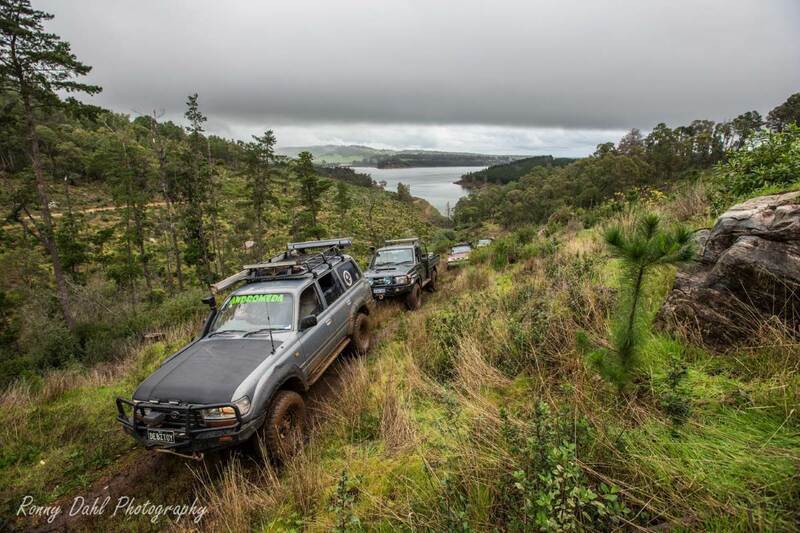 After sorting ourselves out and righting the 4WD up again, we got back to my place, plugged the card in, and watched it happen. She went around the corner up on 2 wheels (The whole way around mind you, would make any stunt driver proud), then it landed on my side, onto the roof and landed on the driver’s side. Turns out that was the best outcome, otherwise if she had corrected herself, we would have hit the curb head on and flown into the air and landed head first into the thick concrete culvert and could possibly be dead. Or worse. I had cuts and bruises all up the left side of me, but luckily nothing worse. 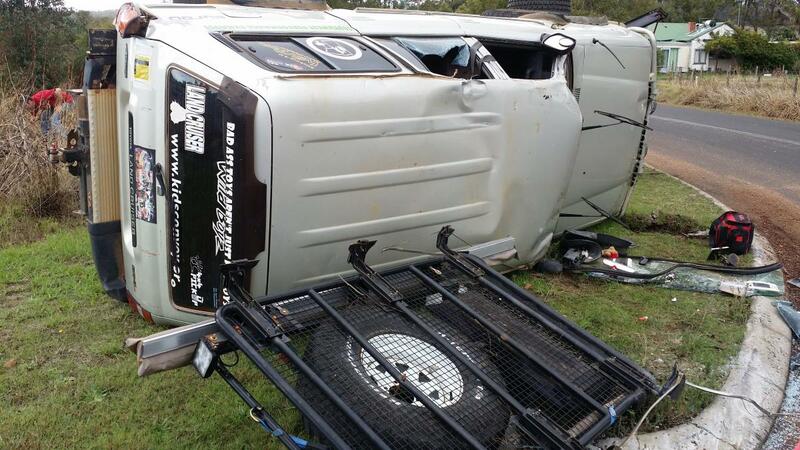 We both walked away relatively injury free. Lift, tyres, rock slider, air compressor and fully recommend the part time kit. BEST thing I have done to my 80. BUT whatever it is that you do, take your time and do it right, and you do not need top of the range or name brands for everything, the cheaper stuff off eBay is just as good and will do the job just as well for under half the cost. 1. Front bar with winch, make sure it is all connected properly and it works as it should. 2. Rear bar for better and easier exits, make sure it’s built properly. 3. Put the part time kit in if you can, BEST thing I’ve done to mine yet. 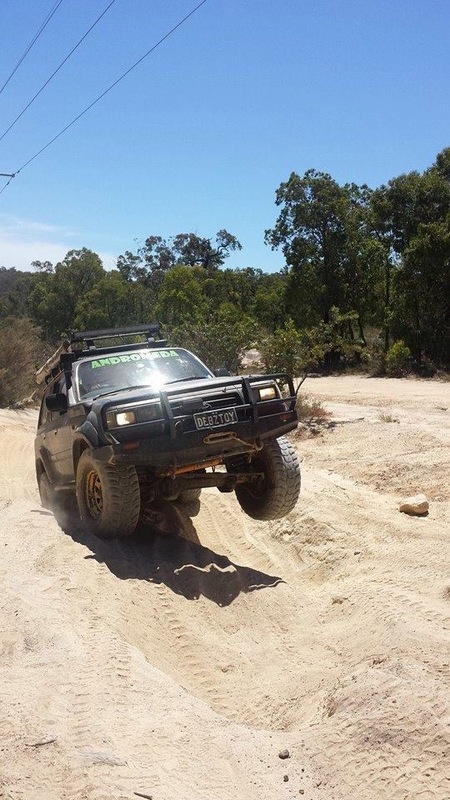 Rigs n Ruts 4x4 club was thought of by my very good friend Bonnie, after a bit of crap that happened from other people we both trusted, we decided we’d had enough of being bullied and targeted, so Rigs n Ruts was created. Bonnie is no longer with us, but her gorgeous other half Jordan and myself have made sure it keeps going and grows from strength to strength and moves forward in a positive light, with help from Admins Ian and Scott. 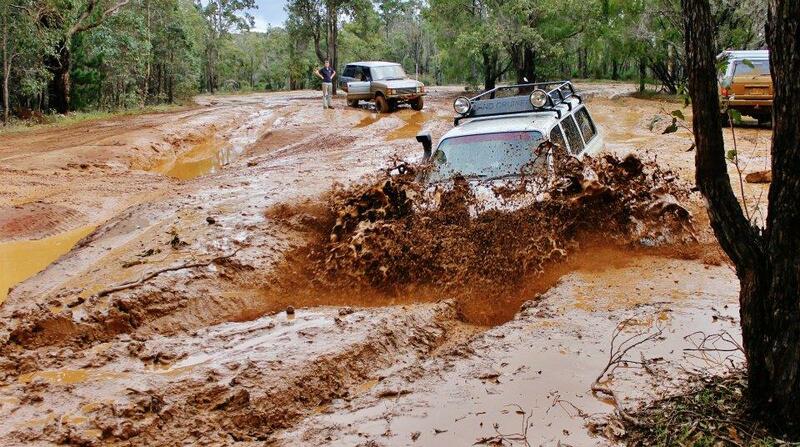 Leave 80 Series Landcruiser And Go 4 Wheeling In Western Australia.